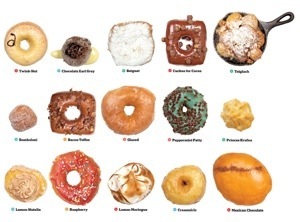 Cake doughnuts are fried, not baked, at your local doughnut shop. But this recipe bakes up just as delicious, and cleanup is far easier, not to mention a bit less guilt-inducing. This batter also bakes up beautifully in an electric doughnut maker. Note: To get the proper doughnut shape when baking cake doughnuts, you do need a doughnut pan with a rounded bottom to each cup and a post through the middle. Baking them on a flat baking sheet will result in flat-bottomed half-doughnuts. If you don’t have a doughnut pan, you can make the same batter and bake it in a muffin tin for doughnut-flavored muffins. The batter also works great with a mini-muffin pan for bite-size treats. 2. Sift the flours and baking powder together into a large bowl or the bowl of a mixer. Whisk in the sugar, nutmeg, and salt. Add the butter and use your fingers to rub it into the dry ingredients as you would in making a pastry crust, until evenly distributed. Add the milk, yogurt, vanilla, and egg and stir until just combined. Do not overmix or your doughnuts may be rubbery. 3. Use a piping bag or a spoon to fill each doughnut cup about three-quarters full, making sure the center post is clear. Bake until doughnuts are a light golden brown and spring back when touched, 6 to 10 minutes. Let cool slightly before removing from pan. Glaze as desired.